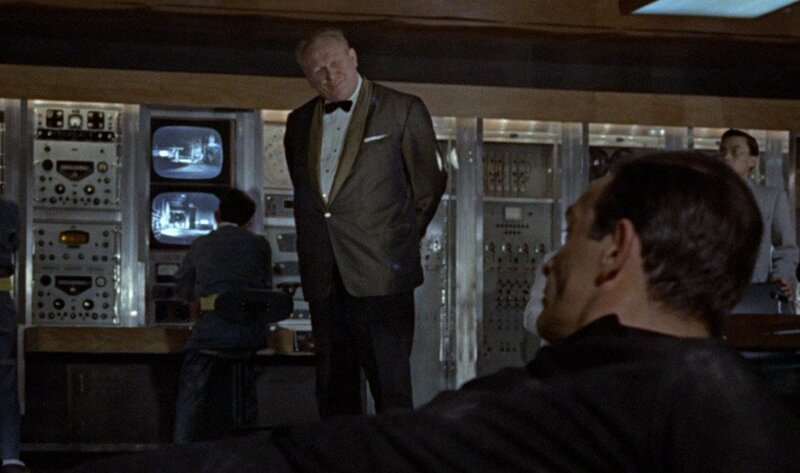 All of Goldfinger’s clothes in the Bond film with the same name are gold in colour, or close to it in yellow or brown. Even though Goldfinger is one of the most garishly-dressed villains, there are still a few things to admire about his clothes. He certainly knows what he likes, and that’s something to appreciate. And as one could expect from a man with a fortune in gold, he wears very expensive clothes. Goldfinger’s dinner jacket is made of a shiny and slubby silk dupioni in a two-tone dark brown and gold weave. The dark brown is in the warp and the gold is in the weft, which is easily visible in crosswise slubs. Silk dupioni is stiff but looks luxurious with its well-known purposeful imperfections visible as slubs. The single-breasted dinner jacket follows tradition with a single button on the front and a shawl collar. The dinner jacket is cut with a clean chest, and the shoulders have a little padding that attempts to straighten Goldfinger’s very large, round shoulders. The jacket has no vent, three buttons on the cuffs and jetted pockets, all following the classic dinner jacket style. The silk dinner jacket is certainly very expensive, but even though it was made for him it doesn’t fit all that well. That may be because silk—especially lightweight silk dupioni—doesn’t have much give and doesn’t tailor as easily as wool does. The flaws in the fit are quite noticeable; there are ripples in the upper chest and pulls at the waist, and the collar sometimes stands away from the neck on the right side. A brown dinner jacket lacks the elegance of a black or ivory dinner jacket, but on the other hand it flatters Goldfinger’s warm autumn complexion more that the more traditional colours would. The gold silk dupioni lapels bring Goldfinger’s favourite colour into the dinner jacket, and gold metal—or likely brass considering it’s only a film costume—buttons add another level of gaudiness to the jacket. 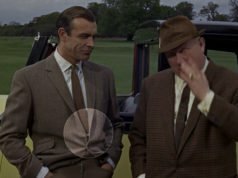 Metal buttons would ordinarily make any jacket look like a blazer, but Goldfinger’s dinner jacket still looks like a dinner jacket since the gold buttons somewhat match the colour of the lapels. 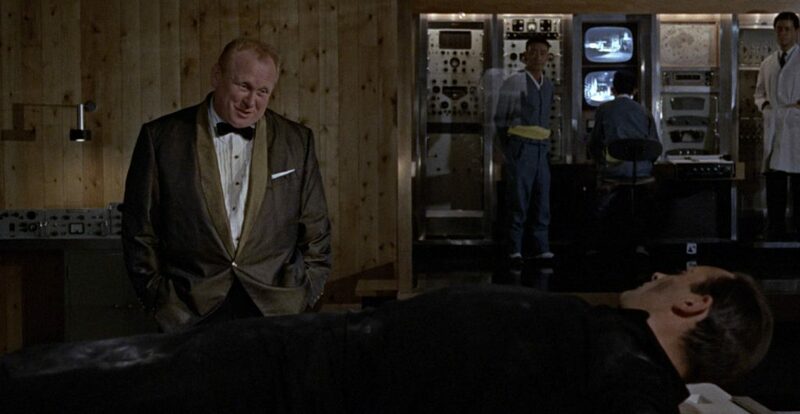 Under the dinner jacket, Goldfinger wears classic black trousers. They probably have a silk stripe down the side of each leg, but the scene is dark and the trousers aren’t seen much so it’s difficult to tell. Goldfinger’s cream fine self-stripe dress shirt from Frank Foster has a rounded point collar—it’s not as rounded as a club collar—and double cuffs. Though the rounded collar is not traditional for black tie and emphasises Goldfinger’s round face and round body, it harmonises with the dinner jacket’s round shawl collar. The front of the shirt is pleated, the placket is stitched close to the centre so that the folds of the placket match the folds of the pleats. The buttons—not studs—down the placket are shanked gold metal. 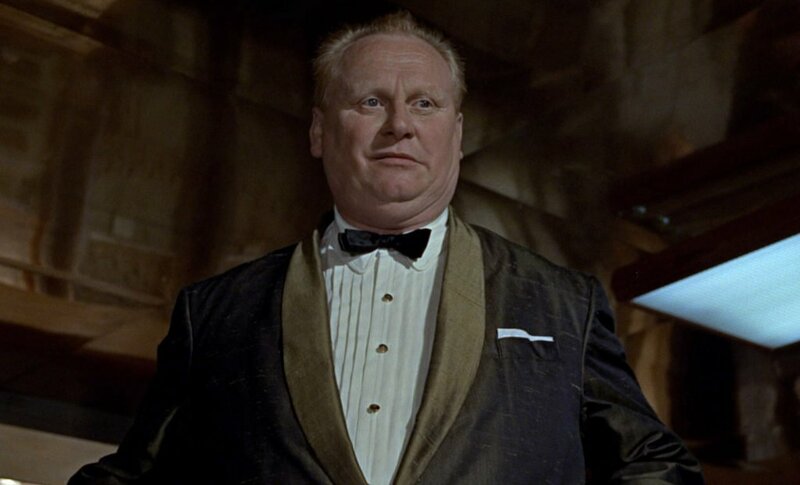 Goldfinger follows black tie convention and wears a narrow black batwing bow tie, which is not a flattering look for his large face. He wears a folded white linen handkerchief in his breast pocket. His shoes are black. Indeed a well-chosen outfit for this kind of character and for a man with a complexion like Frobe’s. There are films in which Frobe is wearing an ordinary black dinner jacket and it never suits him very well. His bright red hair looks kind of disturbing in contrast with the starkness of an all-black outfit. You are right – the cut is poor. I don’t know who made this garment (perhaps Berman’s?) but Italian (Neapolitan) tailors have a reputation of knowing very well how to deal with silk. But nevertheless as a matter of principle (lightweight) silk is perhaps not the ideal material for portly men like Frobe. Frobe reminds me a bit of Alfred Hitchcock. Even though his suits were all bespoke he hardly ever looked elegant. If weight and girth reach a certain degree there’s not much what can be done about it. Quite simply an appallingly ugly outfit. Yes, it does match his complexion but that’s all one can say. It’s a great blog but, to be honest, I really do prefer when you keep it to the Bond actors, Matt. This is an inspiration for no one. I would appreciate it if would carry on as hitherto, Matt. Because if you would have focused entirely on the Bond actors this blog would have been through already . Of course this outfit is not amongst the most tasteful ones but it’s at least interesting. And just think of Roger Moore’s infamous light brown silk suit from TSWLM – to me there’s no big difference in terms of ugliness. And furthermore, among the Bond villains are some very fine dressed ones (Largo of course, Kamal Khan etc.) Why should one rule them out? 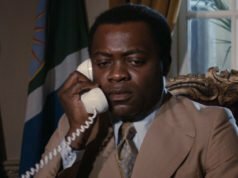 I would like to see some more comparisons of similar outfits through the years (for example, Connery’s brown hacking jacket in GF vs. Moore’s brown hacking jacket in AVTAK, or Lazenby’s tweed suit in OHMSS vs. Moore’s tweed suit in MR). Agreed, Dan. I quite enjoy the comparison pieces. Maybe is from a German tailor? I would guess it’s from an English tailor, or rather a costumier. I agree with the negative comments about this outfit. The sleeves also appear to be too long, with no shirt cuff even close to visible and a lot of bunching of material around the elbow/forearm. Although that said, the previous commenters are correct – Frobe does require something a bit “different”. Conventional clothing doesn’t look quite right on him, and given his obsession with gold, his outfits have to nod in that direction. Matt, please do continue to cover the clothes of characters other than Bond – they’re all part of the films and mostly pretty interesting. I think this perfectly captures Goldfinger, and the color somehow suits Frobe. As I said in my recent comment to Q’s military khakis, this furthers both character and story. I must respectfully disagree with David. Firstly I disagree that this outfit is devoid of inspiration to others. Since Goldfinger is not attending a party or formal affair I believe he is treating this outfit like a smoking jacket. I think for anyone who attends a large amount of semi formal affairs and is looking for an alternative outfit for the more casual ones this post could be a helpful tool. Though I don’t see my self copying this outfit there are some helpful bits of information in the post like the description of the silk’s tailoring difficulties that are useful to know. Secondly though this outfit is not the most becoming and I would not fancy it myself we should not write it, or others like it, off. The costumes the other actors wear say a lot about the characters just as Bond’s clothes do. Goldfinger has taken the time to get dressed up in semi formal wear (admittedly unconventional) to entertain the communist Chinese scientist at his plant, this gives us insight into his character. It is Matt’s blog and he can obviously post anything he wishes. I think that everything so far has been splendid and I get tons of enjoyment out of reading it, so thanks again Matt. I also see value in covering outfits like this. In addition to furthering the character, there are interesting observations to be made about this outfit itself as well. In fact, in other clothes that he wears too. I like the direction the blog is taking. And there simply aren’t enough Bond suits to continue much further, which would be a shame. Matt, I know you asked earlier for ideas and I am late to this, but what about covering things like Connery’s tuxedo from the 1988 Academy Awards (winner, for The Untouchables), or Roger’s from the 1982 Awards where he presented the Thalberg award to Broccoli(and as I recall, looked right out of the greek Casino in FYEO)? Or Connery in The Russia House, as an anti-Bond (surely no less offpoint then some of the Roger films previously covered)? Or any of the actors’ talk show appearances? and please continue covering the various Leiters, villians, henchmen, and any casual clothes that are left! That’s a great idea to write about clothes from award ceremonies and talk shows. Roger Moore often did wear the same exact clothes from his Bond films in these public appearances. “I must respectfully disagree with David. It is Matt’s blog and he can obviously post anything he wishes. I think that everything so far has been splendid and I get tons of enjoyment out of reading it, so thanks again Matt.” Lee, I think I made it clear in my comment that I greatly enjoyed the blog and I personally hold Matt and his work in high regard, so why do you make this misleading and superfluous comment? Then we have Renard’s observation, plucked completely out of the blue (and obviously designed to provoke certain parties) about Moore’s “infamous” brown silk suit. “Infamous” or “ugly” maybe to your eye, however, I have no doubt that with somewhat pared back lapels and trouser flares some blog contributors would find it quite acceptable and wearable and there are a great deal more uglier items worn by Bond throughout the years but I have NO desire to open up something else in this regard YET AGAIN. For me personally (and that is what all comments here surely reflect) it comes down to the inherent quality of tailoring that a particular garment displays. This item and, for example, Q’s Bermuda shorts and shirt as covered in another recent post are of no merit in this regard and therefore not of any interest. 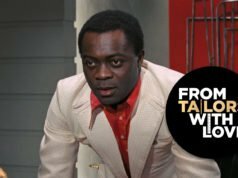 The blog’s title refers to THE SUITS OF JAMES BOND after all though granted Bond’s non tailored items are also included and are often of interest. While I greatly enjoy the blog and (I reiterate) have the height of respect for the man who operates it, I do find a lot of the contributions to be a great deal about one-upmanship and, in some cases, at the level of juvenility. David, I respect your point of view; however, I must disagree that these outfits are of no merit. Frankly, I would rather look at clothes from the Bond films (or at least worn by Bond actors in other contexts) than I would look at perfectly tailored pieces from other actors and characters outside of Bond. As for this specific post, I think one can learn just as much from a poor example of tailoring as one can learn from an impeccable example. So I still derive inspiration, just in the inverse. Just a thought. I don’t mind at all that it’s not just Bond’s clothes we’re discussing – the blog would have closed or started repeated itself by now if that were the case. Plus I’m still learning from these non-Bond posts. I didn’t know, for example, what a “pounded point collar” was. Now I do, thanks to Mr. Goldfinger. I meant to write “rounded” not “pounded”, so I didn’t actually teach you anything new this time. I’ve thought about making a glossary, and it definitely would keep me busy. I heartily second the idea of a glossary! I am awfully sorry that I obviously did upset you – it certainly was not my intention to do so. And judging by the poll’s result it is IMO not an exaggeration to claim that a majority of the blog’s followers also thinks that this suit does not belong to the most tasteful ones which were shown during the series. So I can’t see why my statement should have provoked anyone. Except you perhaps, as you seem to be a fan of this item. But if you feel free to say that Frobe’s silk suit an “appallingly ugly outfit” why should I not have the right to refer to Roger Moore’s as an “infamous” one? I think we all have the right to utter our opinions. Can’t we just calm down a little? This discussion is about suits and not about politics or similar hard stuff. Renard, I just wanted to thank you for your thoughtful and logical post (I was worried that several of us would appreciate it but not mention it). I can’t speak for Matt, but one thing that surprised me about this blog is how strong the emotions can be that we hold about these outfits. But as you say, we aren’t debating politics (or religion!). Matt, the pun was painful. But quite an interesting article (..of clothing). The suit itself may not be that good to look at but it suits the character very well. And Bond villains of course need to dress somewhat outrageously. Otherwise, we get a rather forgettable villain like Elliot Carver. Like LeChiffre’s velvet dinner jacket and Silva’s cream blazer, the clothing subtly shows us what kind of person the villain is. A gold dinner jacket makes perfect sense for Goldfinger. He loves only gold! I find it interesting that most of the jacket features are not outrageous at all: shawl collar, one button closure, no vents, pleated dress shirt. The jacket seems to say that he knows the “rules” but he chose to ignore one of them (the color). And if you don’t like it, he’ll strap you to a table and point a giant laser at your gentleman’s region. It’s funny, but I always thought that the jacket was two different shades of green. I’ve not seen this on Blu-ray, and when I saw it in a theatre it was an old print on film. While the sharpness and detail were incredible, the colours seemed off and certainly not very bright…I guess I just assumed that everything looked more brown-ish due to that! “As for this specific post, I think one can learn just as much from a poor example of tailoring as one can learn from an impeccable example. So I still derive inspiration, just in the inverse. Just a thought.” Thank you, FS, for your fair and reasonable response to my perfectly reasonable original comments and this is indeed a good point. It’s refreshing when adults behave as such and “play the ball, not the man”. Christian/Matt, great idea about the awards ceremonies and talk shows. Good fodder there especially I would say from the likes of Moore, Brosnan and Craig and DEFINITELY more of the comparisons as Dan helpfully suggested.